The Geologist's Pick – Page 2 – Things of geological interest and more. 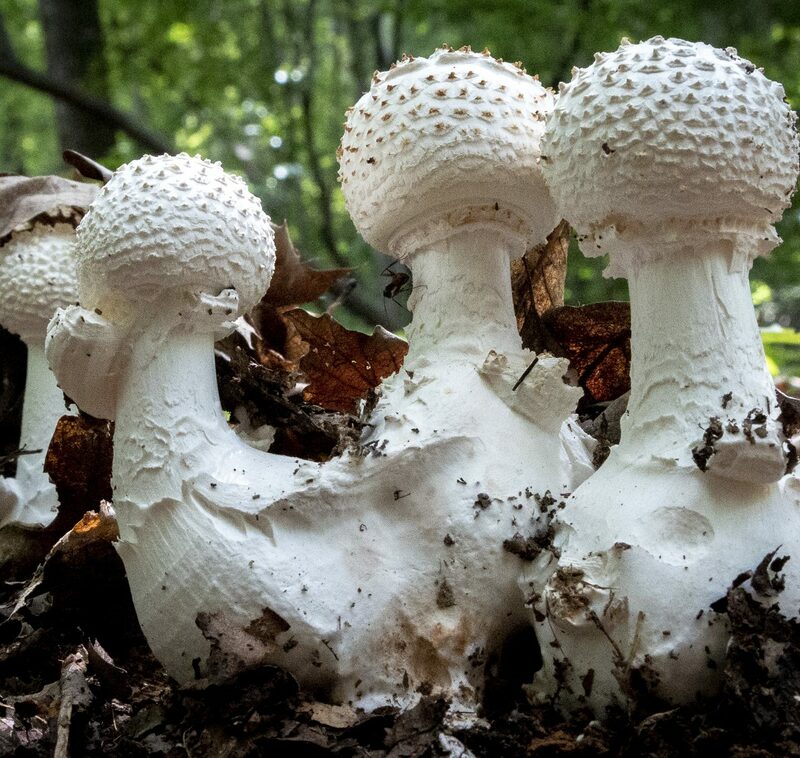 These are images of mushrooms from the Uwharrie National Forest in Montgomery County, North Carolina. 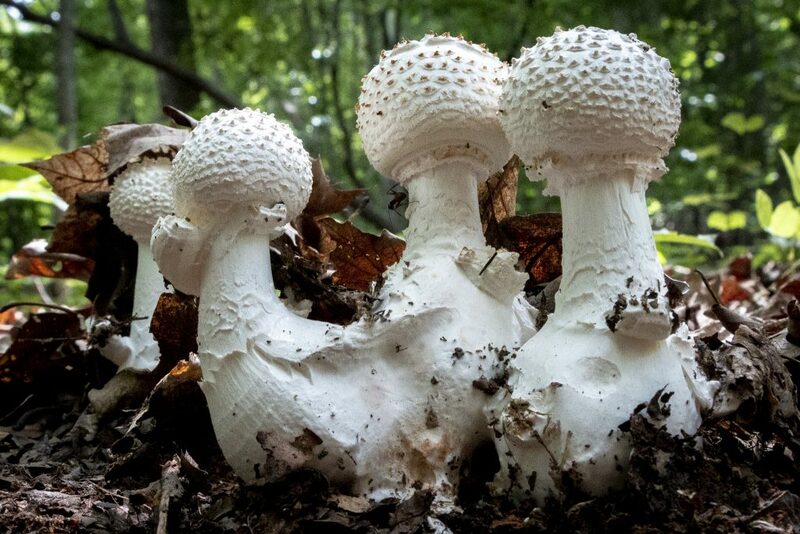 The fungi are from the genus Amanita (Basidiomycetes > Agaricales > Amanitaceae). 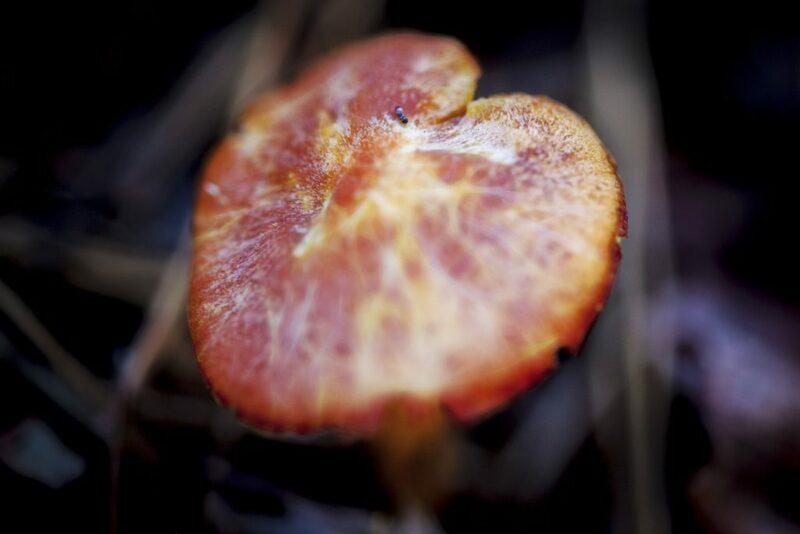 The bulbous stem base and other features put these in Amanita section Lepidella. I have not attempted to determine a species. These are relatively young. When mature, they will have a characteristic mushroom shape with gills. 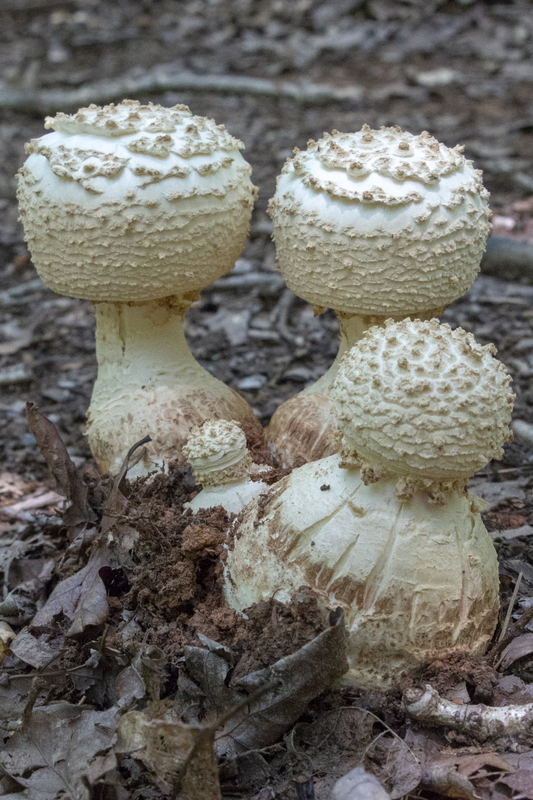 The Amanita are very common in North Carolina. Some are edible but some are also deadly, and the variants are hard to identify. The caps of these specimens have not opened yet. 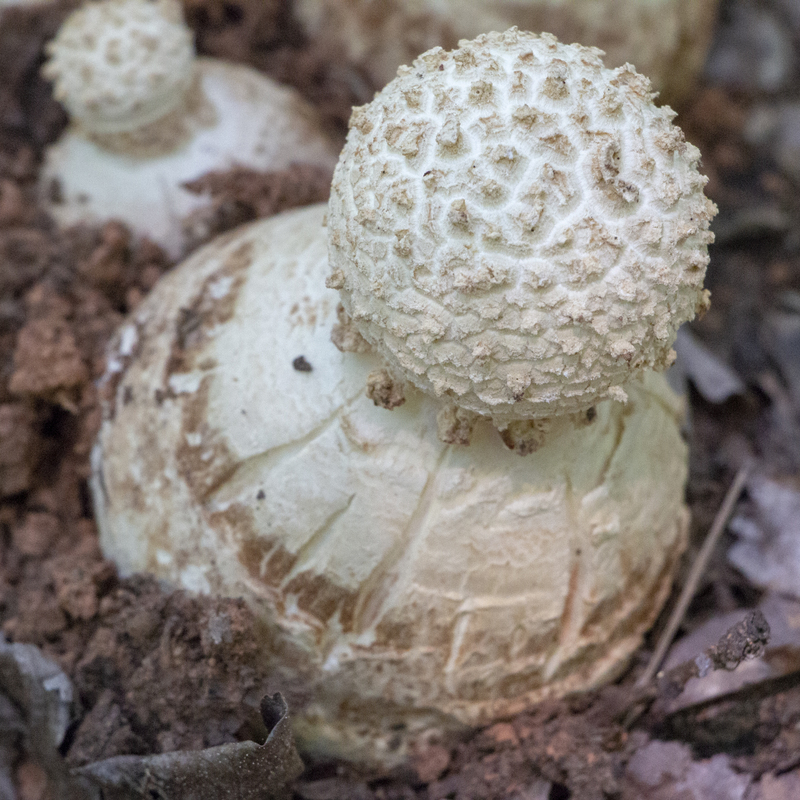 Early on, they may look like puffballs, but a cross-section (see one of the images below) will show the developing mushroom shape. 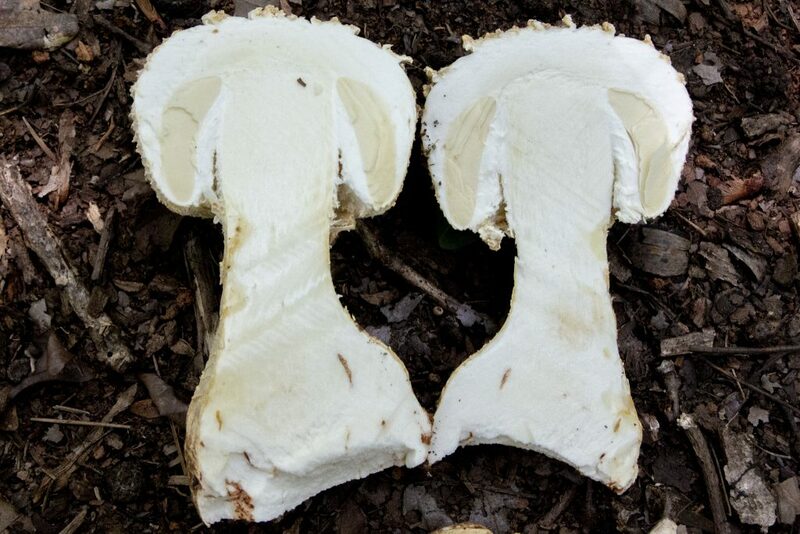 These particular mushrooms have swollen, bulbous stem bases that are conjoined. The stem and base are somewhat shaggy. 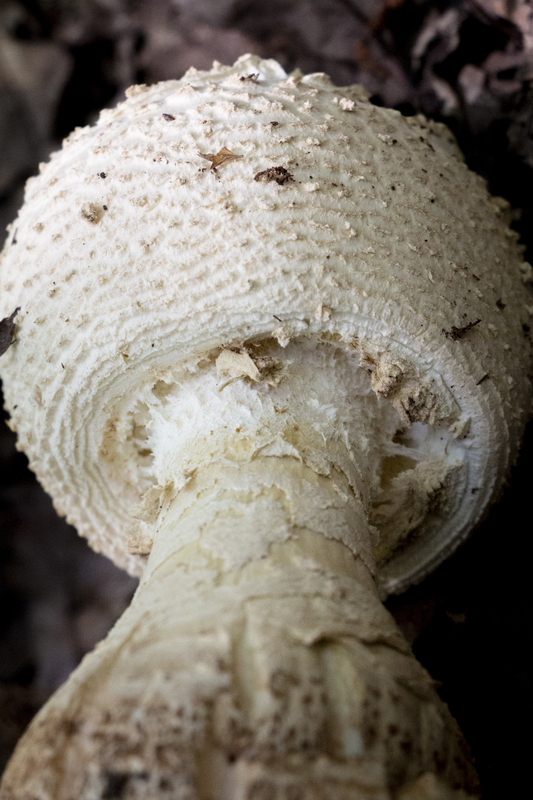 The caps are covered by dense warts. 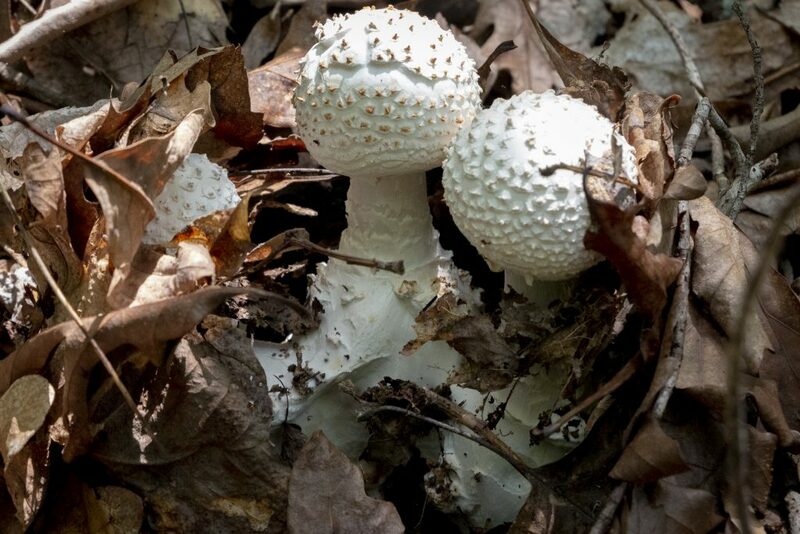 These species do not discolor when bruised (some Amanita do), have a mild scent, and a dense flesh like bread dough. All of the images you see here are from a relatively small area under a hardwood, mainly oak, cover and in very rocky soil. As usual, I discovered these specimens on the way to doing something else, in this case geologic mapping but I expected to see many fungi because it was June, peak season, and not long after heavy rain. Enjoy the mini-tour. Shallow water corrugates as it flows over the curved surface of Brown Mountain granite in Wilson Creek, North Carolina. 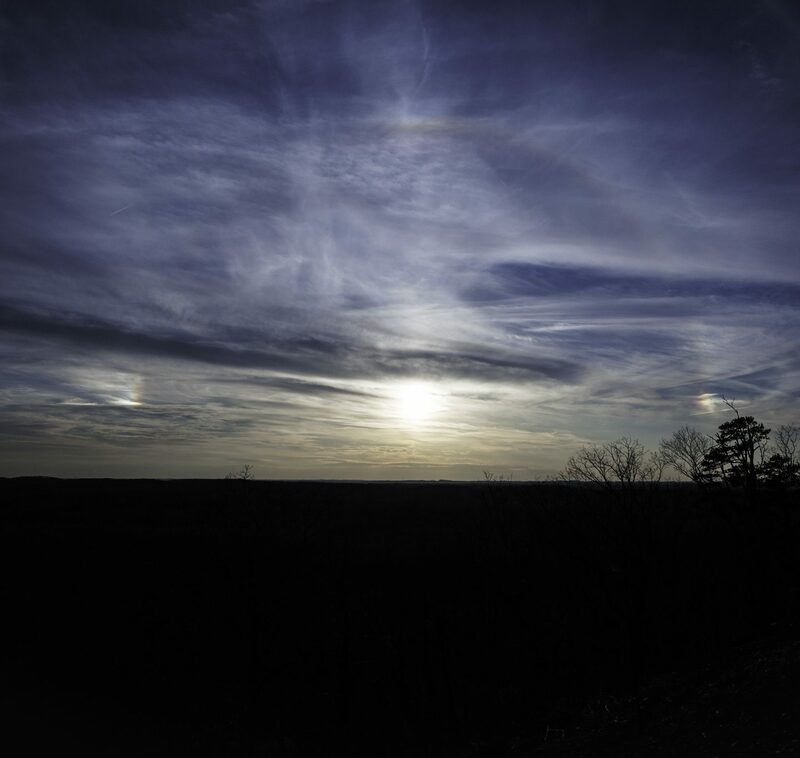 Crests in the flow act like lenses creating many suns between many vales. 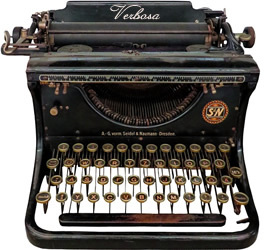 This image is ©Andy R. Bobyarchick. Flat Creek southeasterly through Lancaster County, South Carolina. 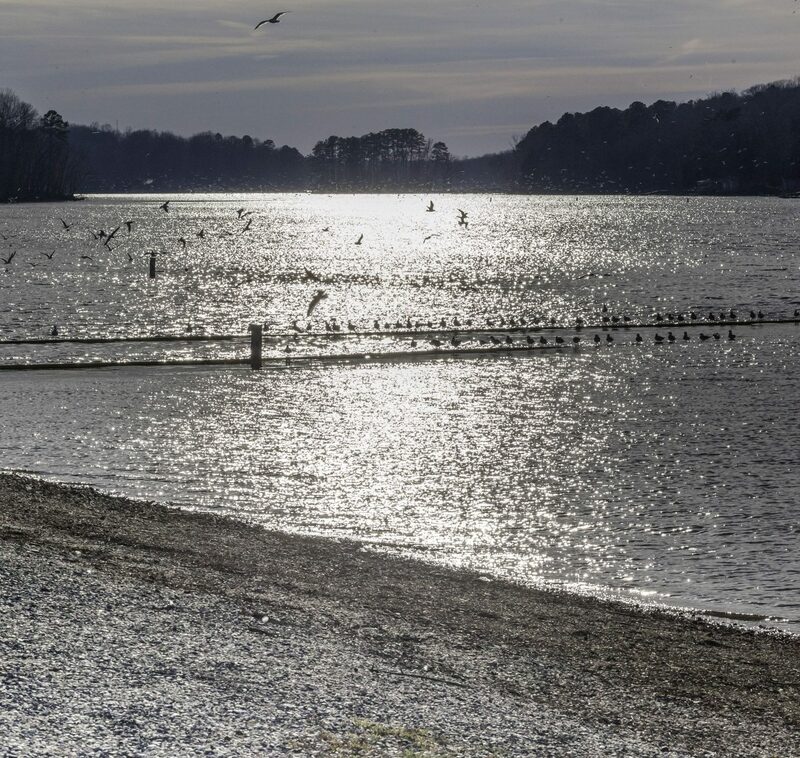 The stream feeds into Lynches River, that farther southeast joins the Great Pee Dee River. The Pee Dee joins the Waccama River at Georgetown on the SC Atlantic Coast. Flat Creek carries a heavy load of sediment. Where this image was made, the stream crosses the Pageland granite, a pluton that is about 300 million years old. The granite is coarse-grained and sheds considerable quartz and feldspar grains as it weathers and erodes. This image is a 180° panorama around a meander bend in Flat Creek. 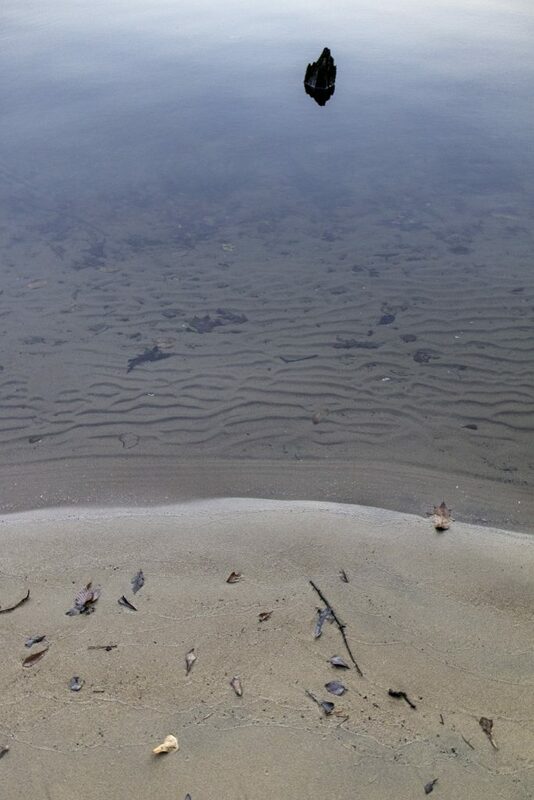 Lower water velocity on the inside of the meander causes the coarser sediment load to drop out to form a sandy point bar. The near bank of the river is being undercut by erosion on the outside of the meander where water velocity is greater. In time, the stream channel will migrate toward this cut bank. It’s difficult to see in the shadows, but in the lower left corner of the photograph a tributary trickles into the main channel, and there are abundant beaver tracks there. Beavers use the tributary mouth as a slide. In the lower right corner of the photograph you can see a boulder of Pageland granite. It’s rounded shape is characteristic of spheroidal weathering of a larger mass of granite bedrock. Not far to the southeast, Flat Creek crosses from Piedmont igneous and metamorphic rocks into sedimentary rocks of the Sandhills. This image was made late on a Spring afternoon under a brilliant blue sky reflecting off the water’s surface and under the long shadows of hardwood trees yet to put out theire leaves. 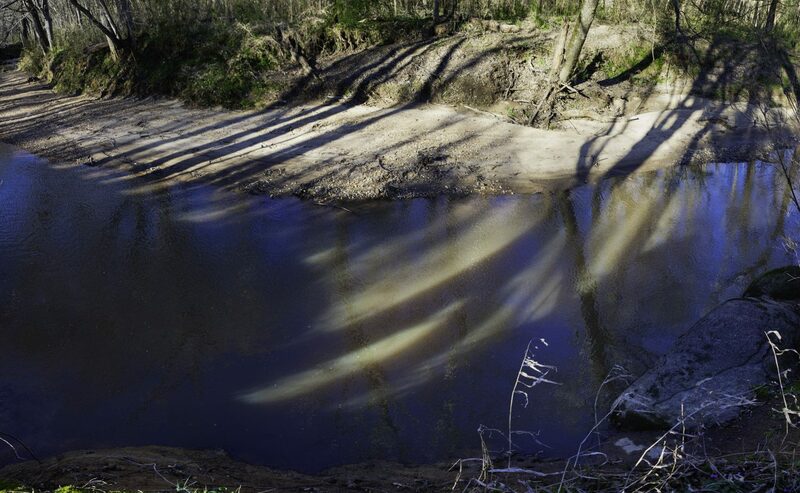 A meander bend and point bar in Flat Creek near Taxahaw, SC. Ignatius Watsworth Brock (1866-1950) was a photographer, artist, and poet who worked out of New Bern and Asheville, NC. 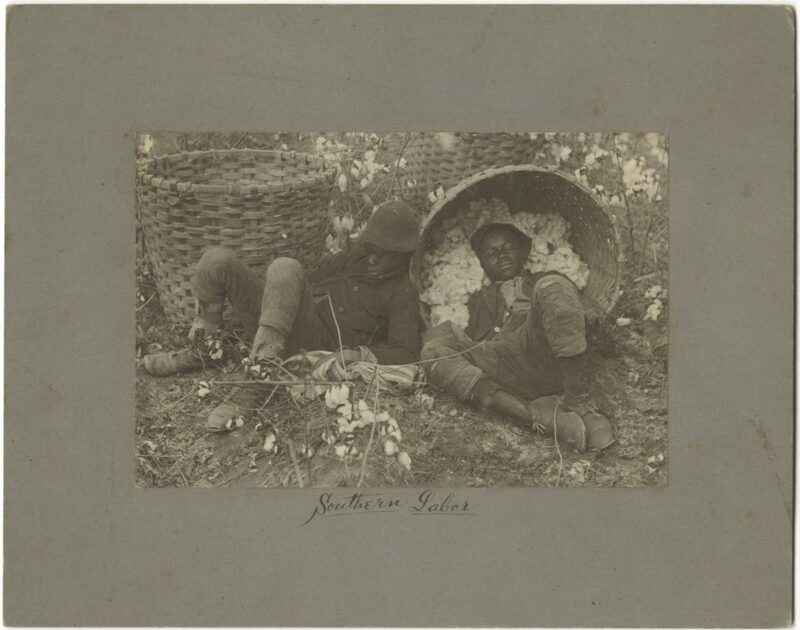 Images that he made roughly between 1889 and 1934 are collected at the North Carolina Collection Photographic Archives at the University of North Carolina at Chapel Hill. Nace Brock made photographs (and drawings) of people and places in North Carolina. Some of the photographic materials in the archive are from glass plates, others from photographic prints. 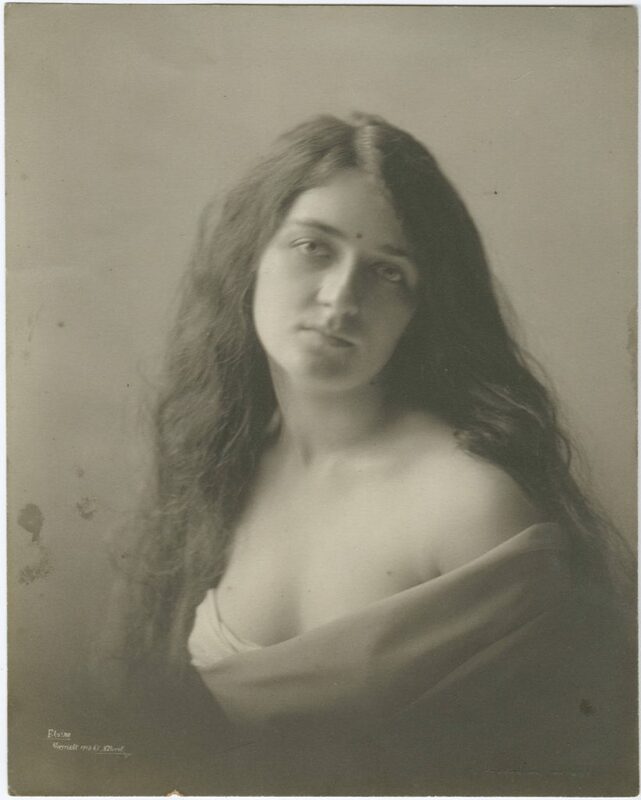 Some of his portraiture is stunning in how he captured his subjects’ personalities in stillness. 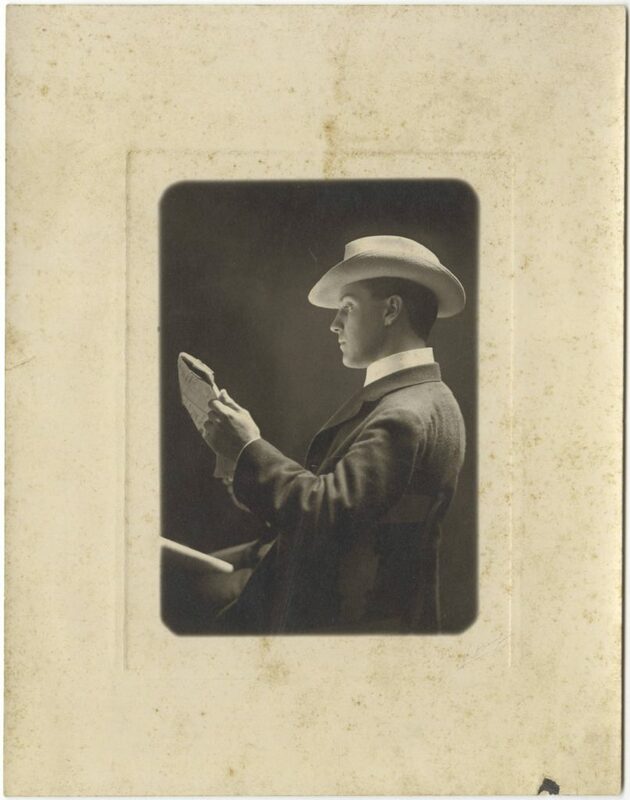 Most of the character photographs in the collection are from 1889-1938. 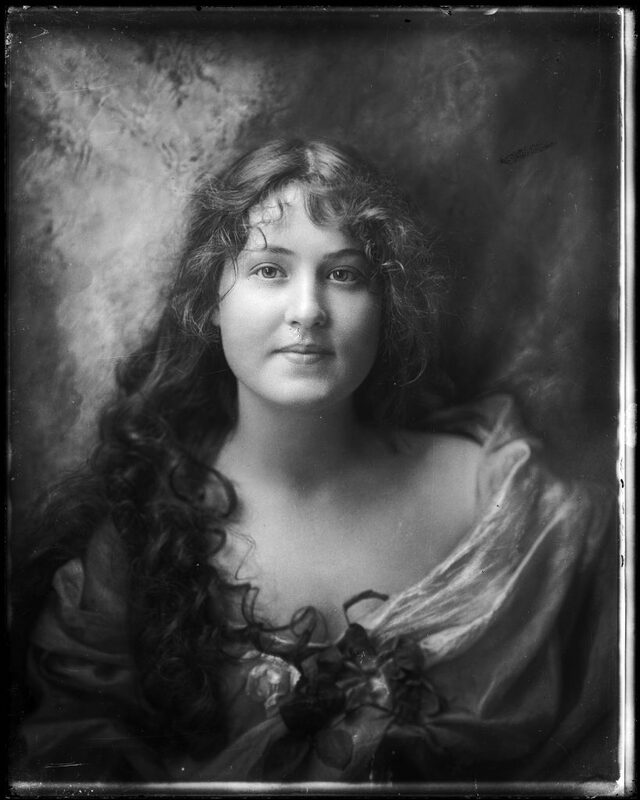 During most of that time period, people did not smile for portraits by convention, although in some of the photographs you can see a hint of a smile on the subject’s lips or in her eyes. 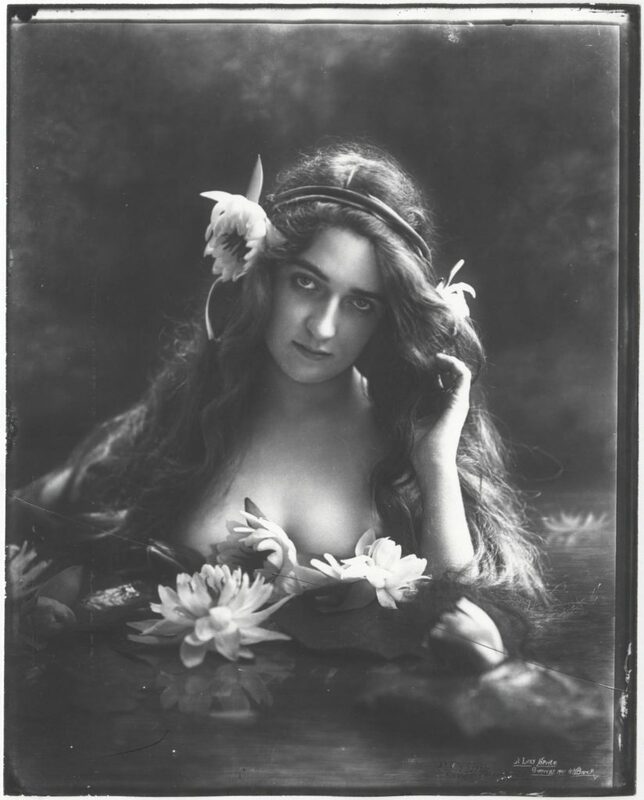 Here are a few images extracted from the collection. It’s impossible to view these images without wondering who these people were, what they were thinking, and where they went for the rest of their lives. You can almost reach out and touch them. 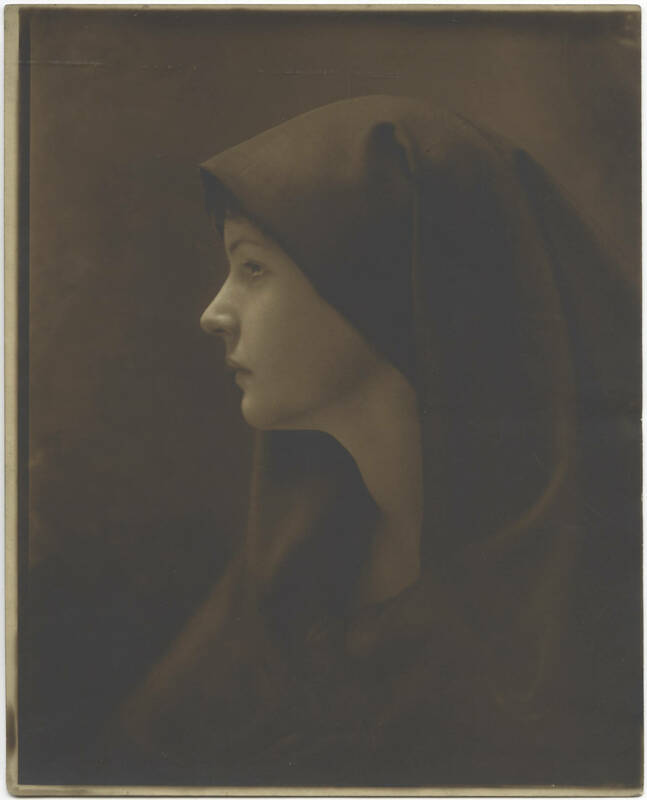 Unidentified Girl, in the Nace Brock Photographic Collection and Related Materials #P0044, North Carolina Collection Photographic Archives, The Wilson Library, University of North Carolina at Chapel Hill. 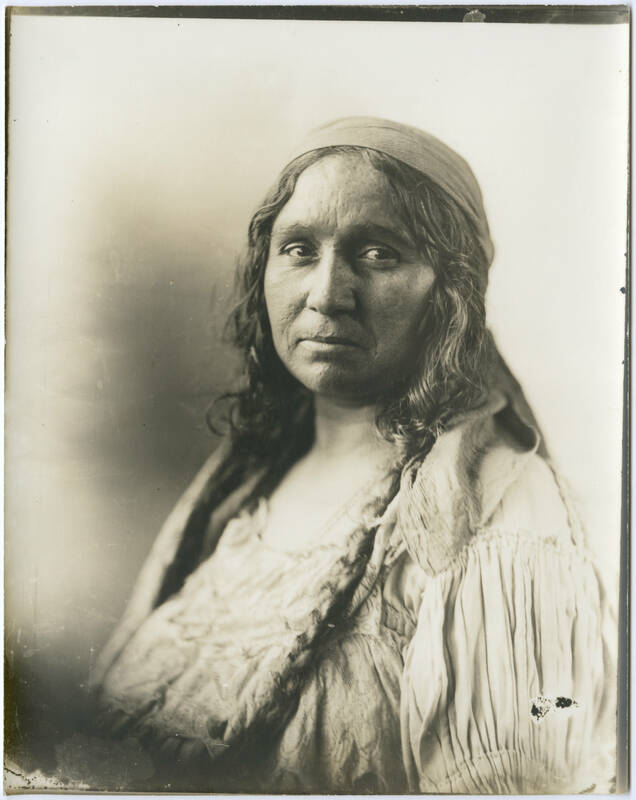 Cherokee Woman, in the Nace Brock Photographic Collection and Related Materials #P0044, North Carolina Collection Photographic Archives, The Wilson Library, University of North Carolina at Chapel Hill. 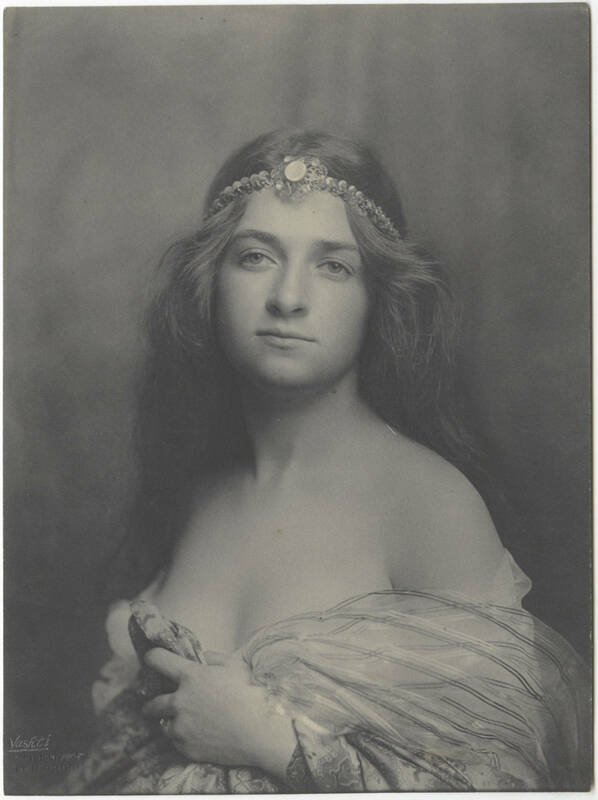 Vashti Circa 1905, in the Nace Brock Photographic Collection and Related Materials #P0044, North Carolina Collection Photographic Archives, The Wilson Library, University of North Carolina at Chapel Hill. 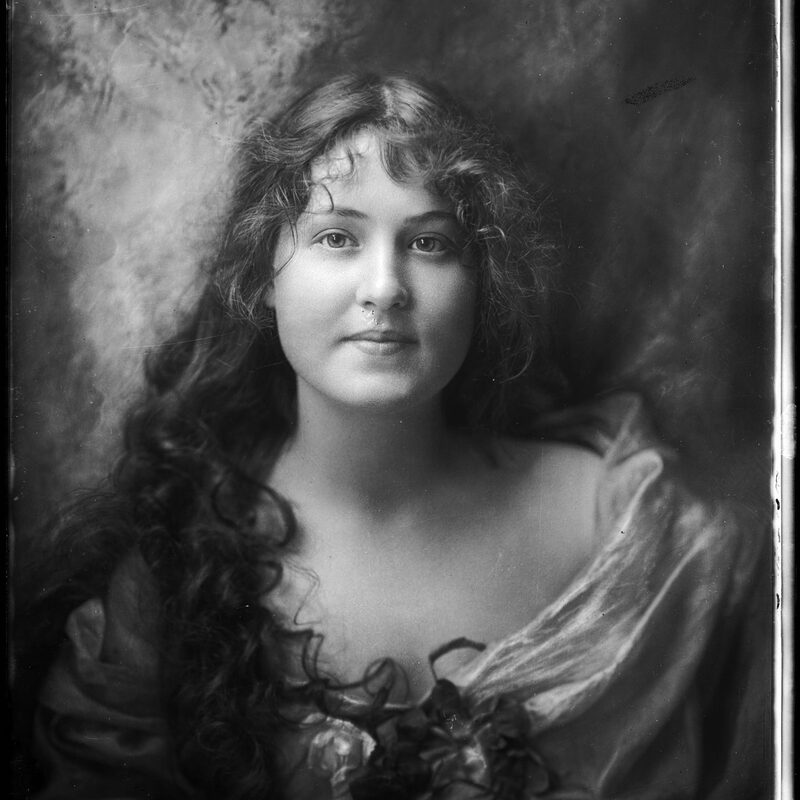 Elaine Circa 1903, in the Nace Brock Photographic Collection and Related Materials #P0044, North Carolina Collection Photographic Archives, The Wilson Library, University of North Carolina at Chapel Hill. Eleanor Inman, in the Nace Brock Photographic Collection and Related Materials #P0044, North Carolina Collection Photographic Archives, The Wilson Library, University of North Carolina at Chapel Hill. 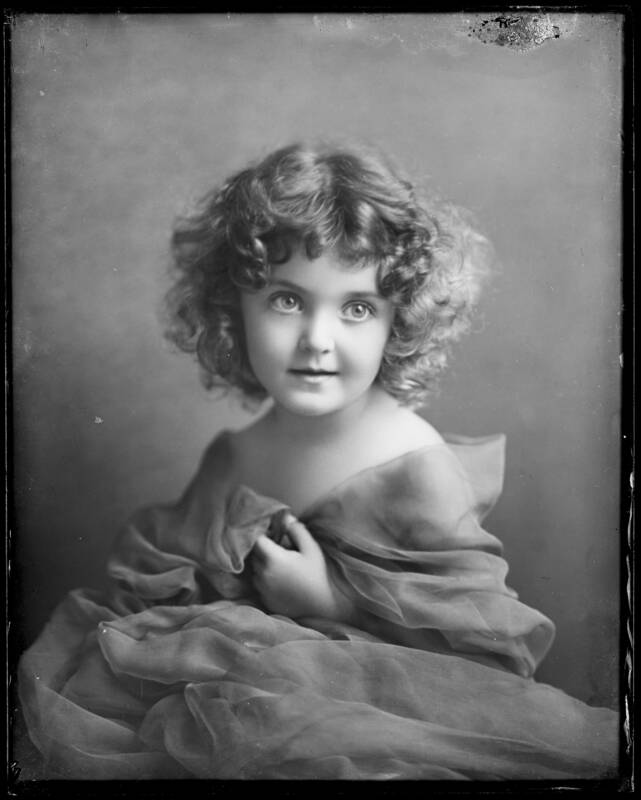 Innocence Unidentified Girl 1906, in the Nace Brock Photographic Collection and Related Materials #P0044, North Carolina Collection Photographic Archives, The Wilson Library, University of North Carolina at Chapel Hill. 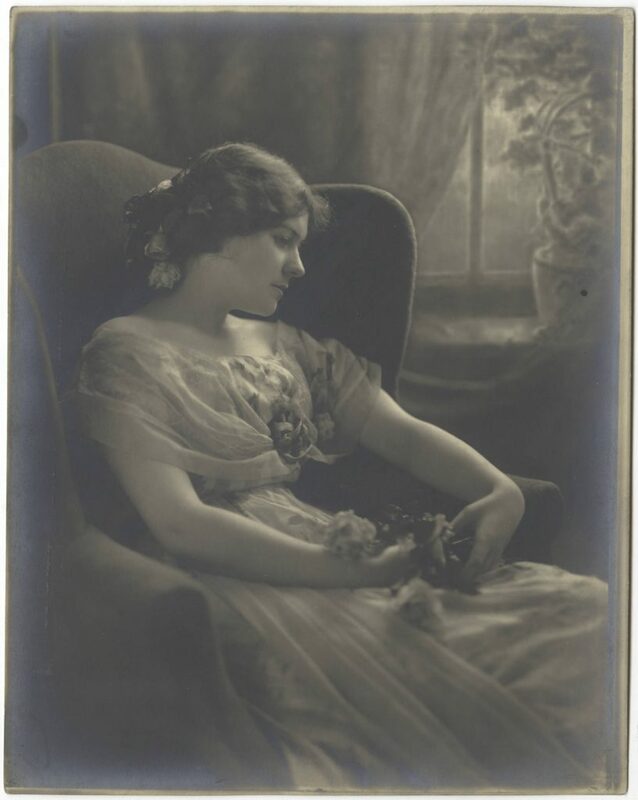 A Lilly Sprite, in the Nace Brock Photographic Collection and Related Materials #P0044, North Carolina Collection Photographic Archives, The Wilson Library, University of North Carolina at Chapel Hill. 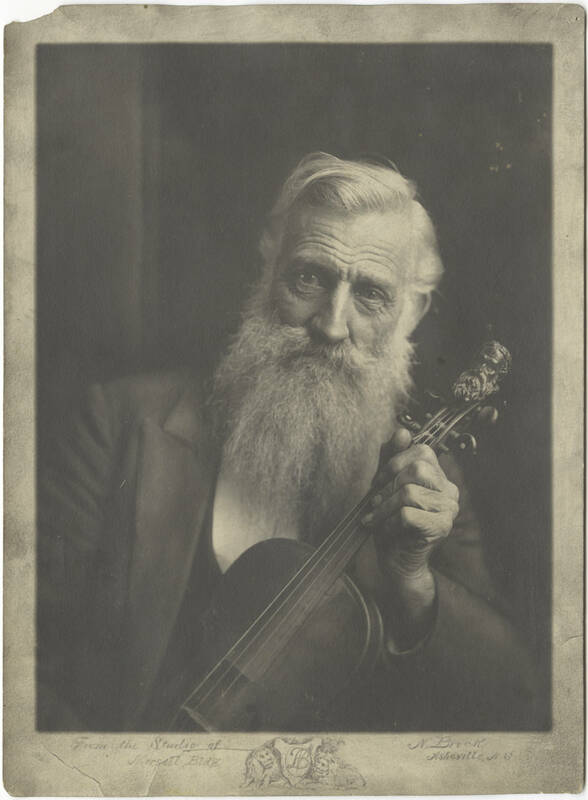 Man with Violin, in the Nace Brock Photographic Collection and Related Materials #P0044, North Carolina Collection Photographic Archives, The Wilson Library, University of North Carolina at Chapel Hill. A Mid-Summer Dream, in the Nace Brock Photographic Collection and Related Materials #P0044, North Carolina Collection Photographic Archives, The Wilson Library, University of North Carolina at Chapel Hill. The Model’s Criticism, in the Nace Brock Photographic Collection and Related Materials #P0044, North Carolina Collection Photographic Archives, The Wilson Library, University of North Carolina at Chapel Hill. 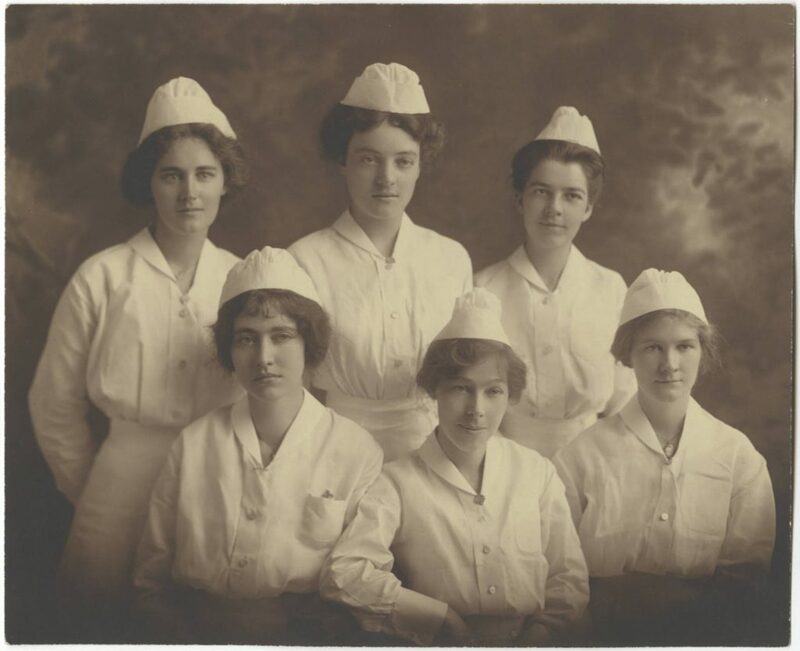 Nurses, in the Nace Brock Photographic Collection and Related Materials #P0044, North Carolina Collection Photographic Archives, The Wilson Library, University of North Carolina at Chapel Hill. Southern Labor, in the Nace Brock Photographic Collection and Related Materials #P0044, North Carolina Collection Photographic Archives, The Wilson Library, University of North Carolina at Chapel Hill. 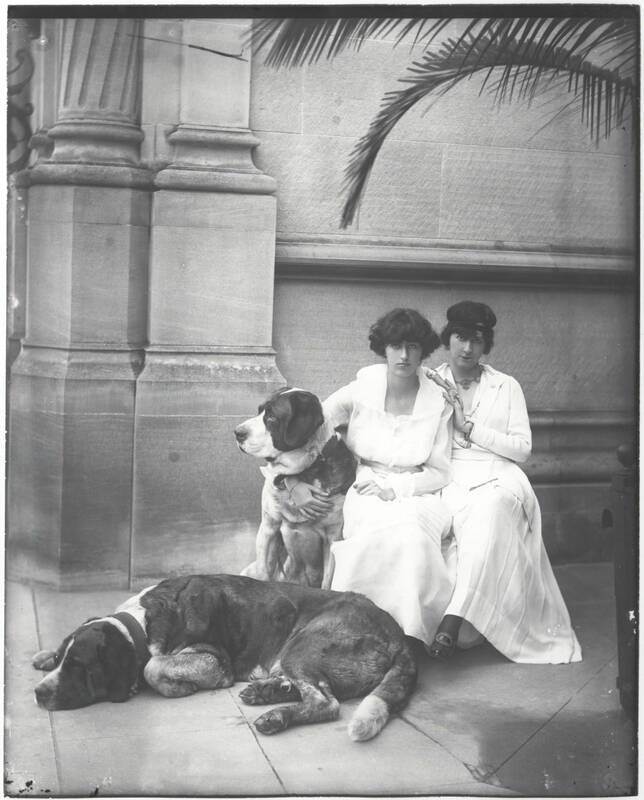 Cornelia and Edith Vanderbilt, in the Nace Brock Photographic Collection and Related Materials #P0044, North Carolina Collection Photographic Archives, The Wilson Library, University of North Carolina at Chapel Hill. 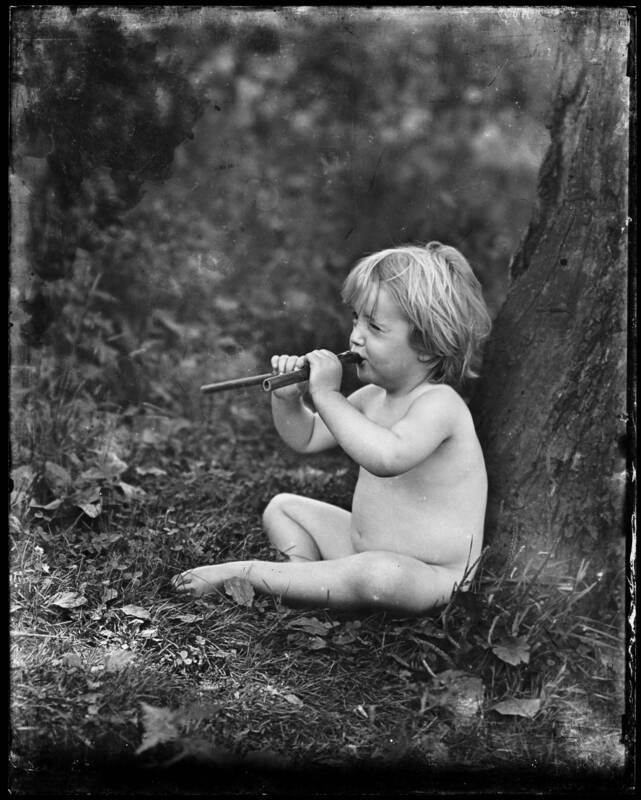 Unidentified Child, in the Nace Brock Photographic Collection and Related Materials #P0044, North Carolina Collection Photographic Archives, The Wilson Library, University of North Carolina at Chapel Hill. Unidentified man, in the Nace Brock Photographic Collection and Related Materials #P0044, North Carolina Collection Photographic Archives, The Wilson Library, University of North Carolina at Chapel Hill. 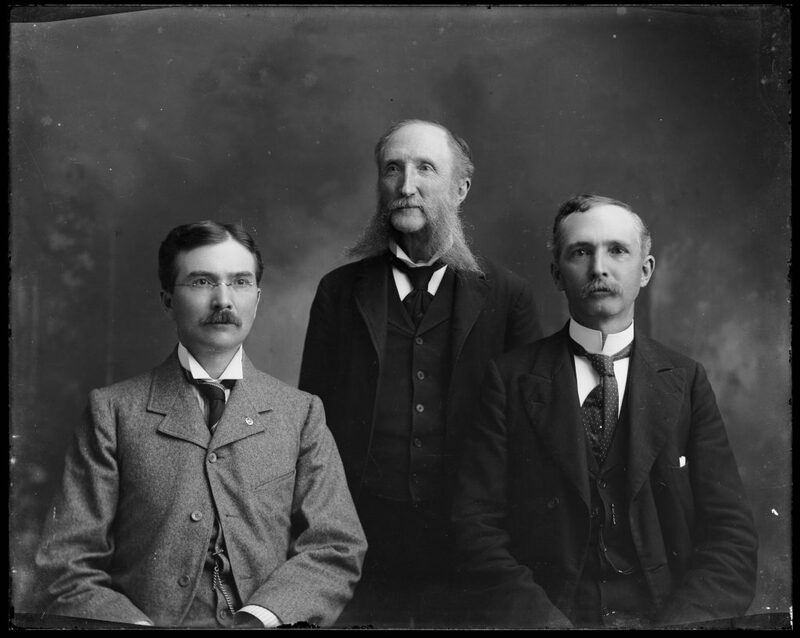 Unidentified Men, in the Nace Brock Photographic Collection and Related Materials #P0044, North Carolina Collection Photographic Archives, The Wilson Library, University of North Carolina at Chapel Hill. 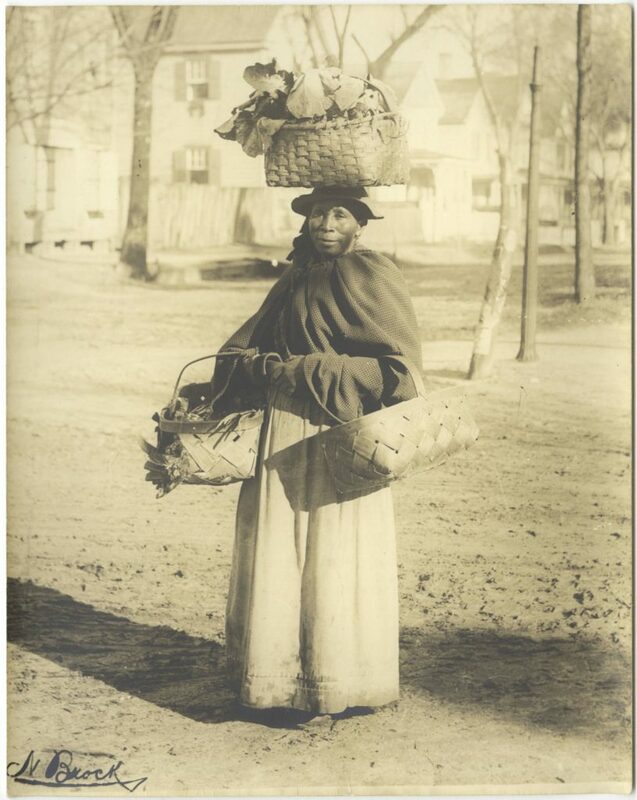 Unidentified woman, in the Nace Brock Photographic Collection and Related Materials #P0044, North Carolina Collection Photographic Archives, The Wilson Library, University of North Carolina at Chapel Hill. Unidentified African-American, in the Nace Brock Photographic Collection and Related Materials #P0044, North Carolina Collection Photographic Archives, The Wilson Library, University of North Carolina at Chapel Hill. 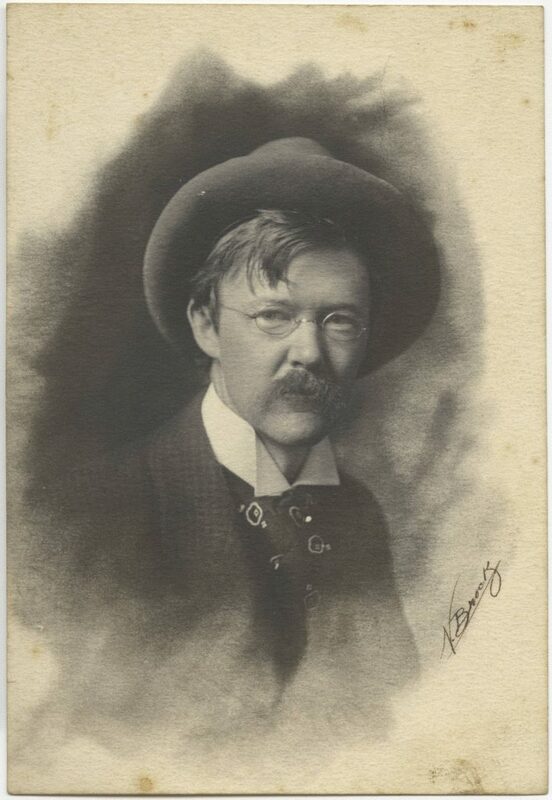 Nace Brock, in the Nace Brock Photographic Collection and Related Materials #P0044, North Carolina Collection Photographic Archives, The Wilson Library, University of North Carolina at Chapel Hill. Happy Valentine’s Day from me and my friends in the Underworld! Morrow Mountain State Park, NC. Image ©Andy Bobyarchick. 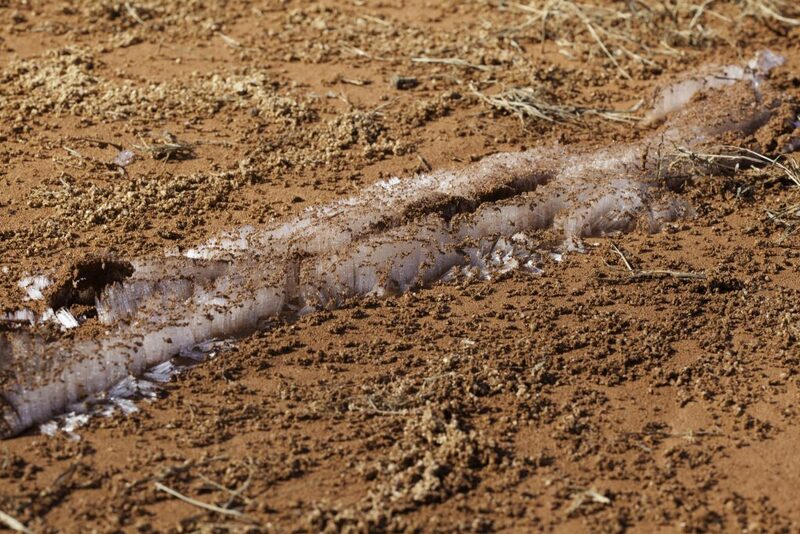 Needle ice forms in porous, wet soil or sediment when the soil temperature is above freezing and the surface atmosphere temperature is below freezing. 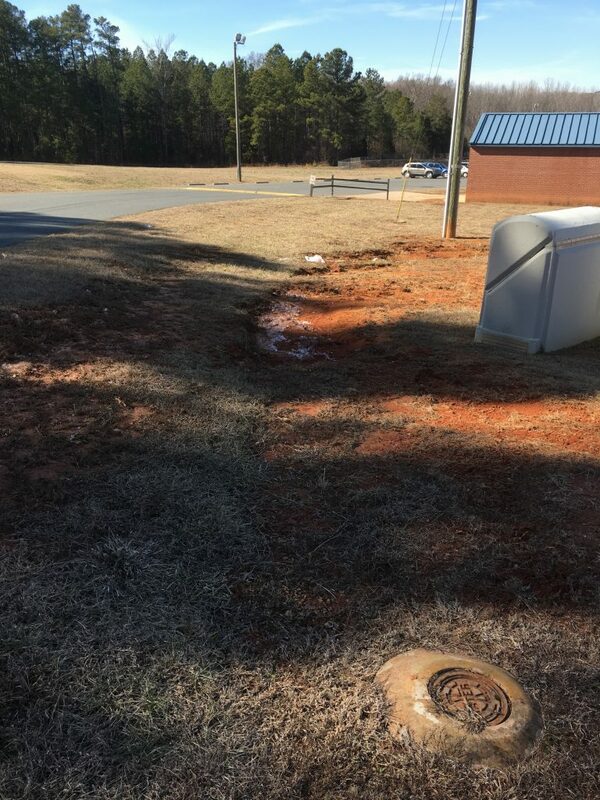 Permeability is important. Capillary action pulls water up toward the surface where the water freezes at the bases of growing ice crystals. 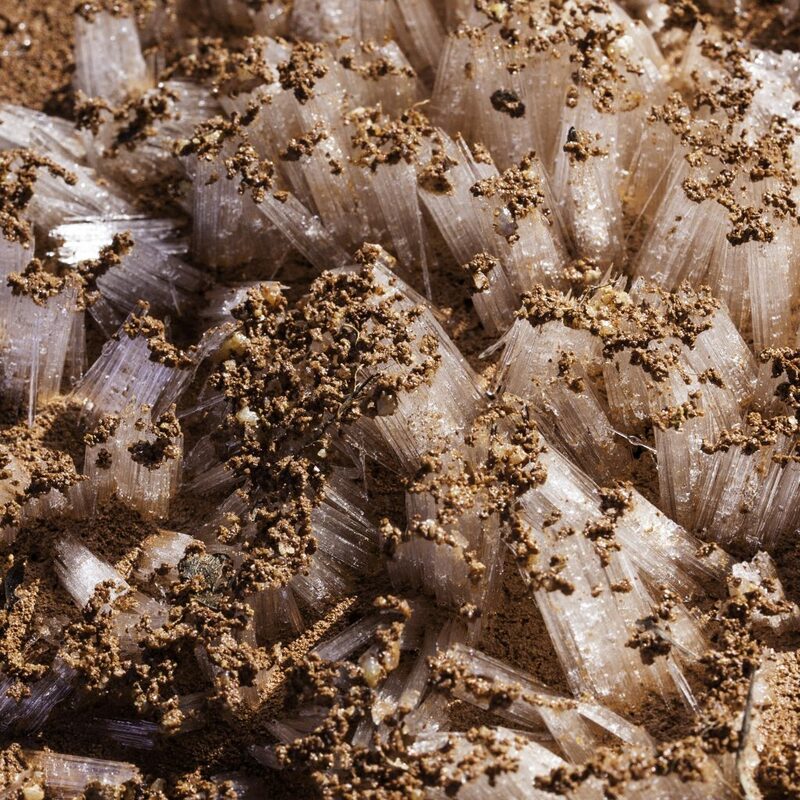 The growing crystals are capable of lifting small particles and vegetation above the normal soil surface. This differential motion can thoroughly disaggregate and disrupt the upper several centimeters of the soil profile in temperate climates. The images in this gallery were made in an elementary school yard where patches of bare soil are exposed. By the time I walked over the yard, the sun had melted most of the crystals except for those protected by shadows. Most of the single, larger grains on top of the crystals are coarse sand, perhaps around 2 mm (millimeters) in diameter. All photographs in this post ©Andy R. Bobyarchick. This is a cluster of mostly standing needle ice crystals. Some of the crystals have toppled over as they began to melt. 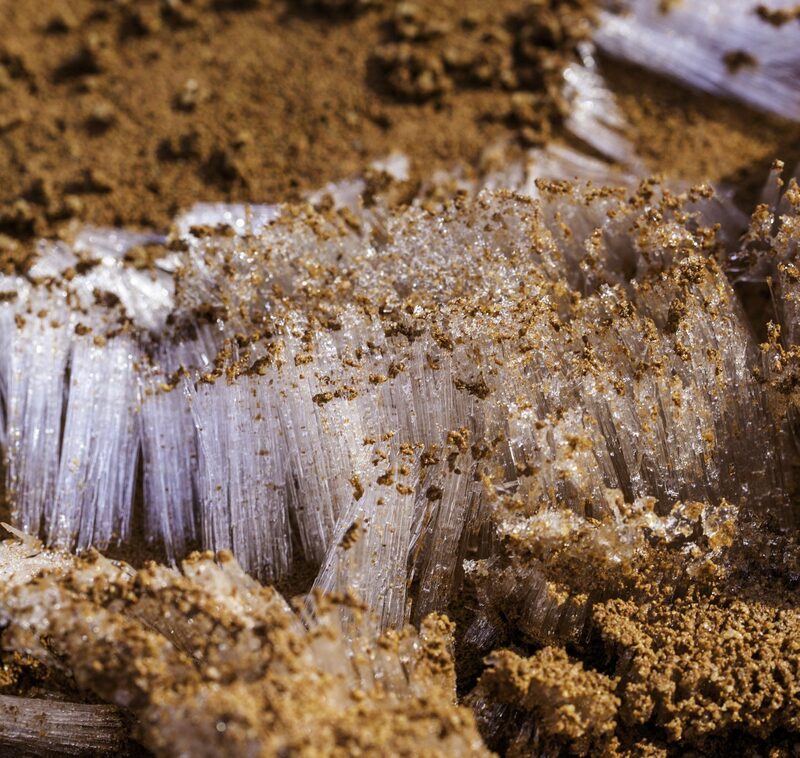 It’s likely that these crystals grew during a single freeze and growth event. In clusters with multiple growth events, there is often an intermediate layer of soil particles embedded across the axes of the crystals. 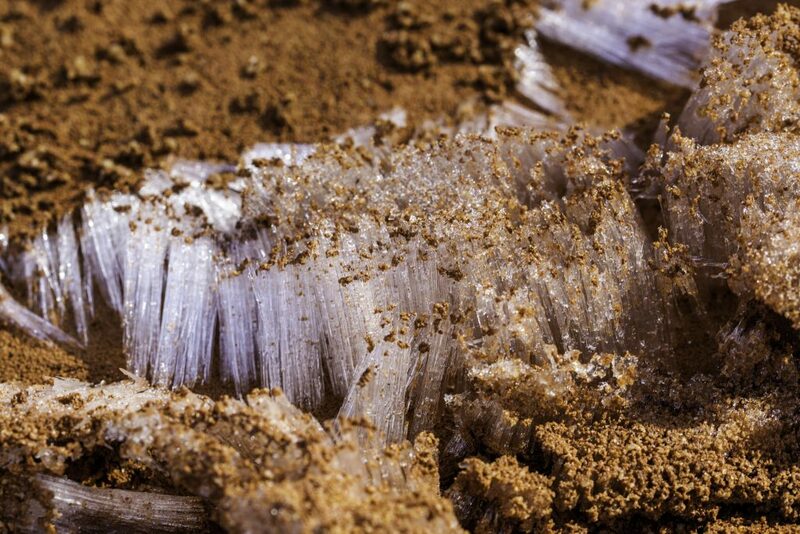 Bundles of needle ice crystals in this cluster have fallen in different directions, probably oriented toward the least resistance or toward first melting. Some of the crystals have become detached fibers. 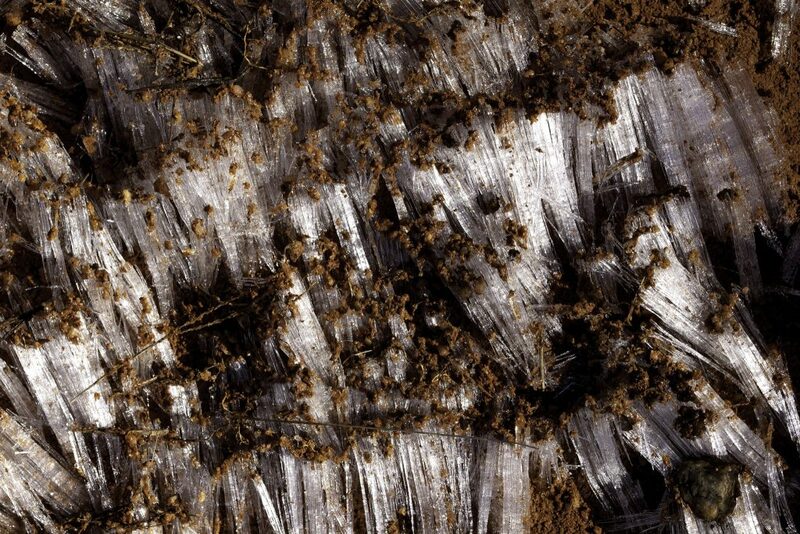 If you look closely, you can see that many of the needle ice individuals have longitudinal trains of bubbles. These may be air bubbles released as the crystals warm up and expand, or trapped during crystal growth. 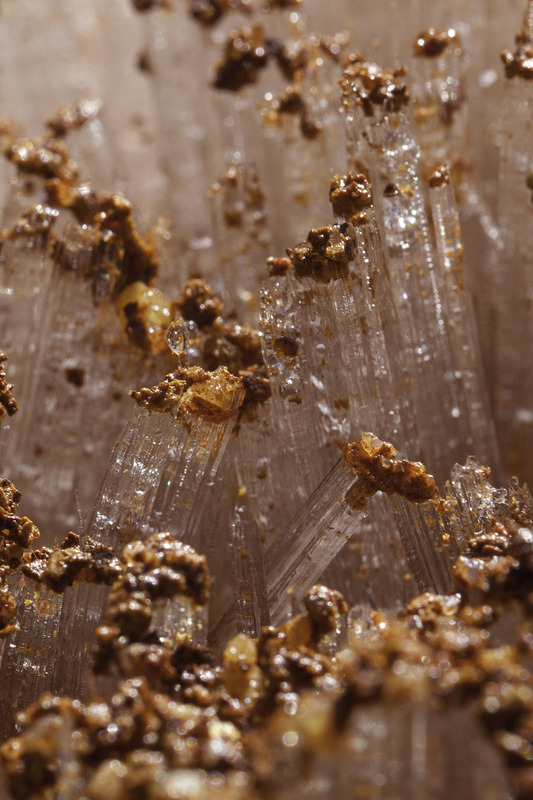 Whatever they are, the bubbles enhance the intricate internal structure of the crystals. As though swept over by a wind, these translucent, melting crystals all tilted in the same direction, roughly toward the east. It may be that eastern members of the cluster melted earlier in the day (this image was made at 1:29 PM), creating space for these crystals to fall. Here are some fibrous crystals, all fallen but many retaining their sandy caps. 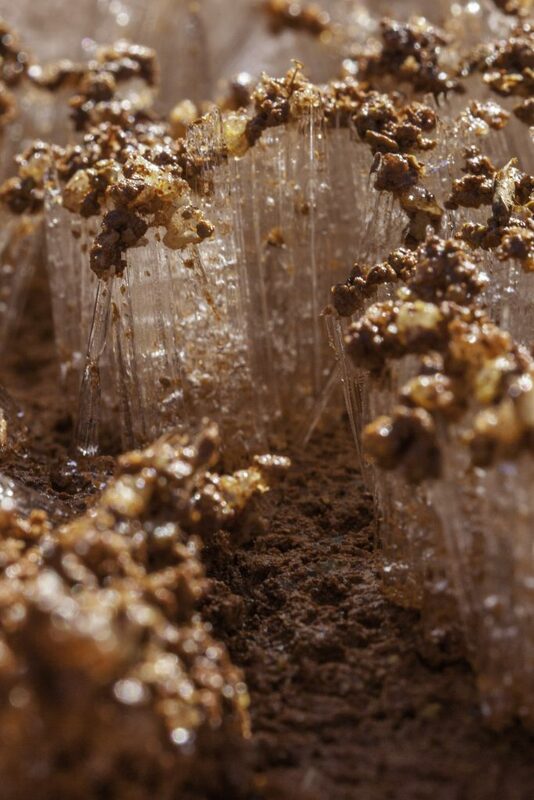 Here is a very close view of a crystal forest with sand parapets overlooking great chasms. Into the deep canyons you go. 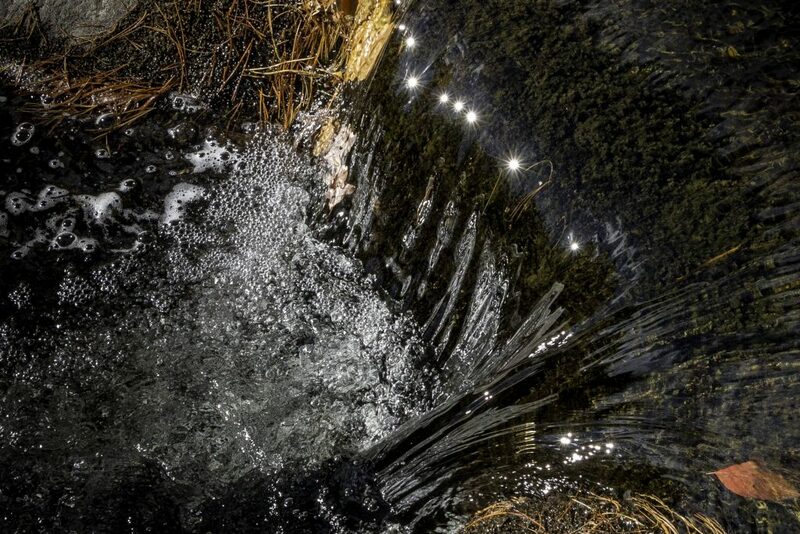 Here is a streamlet of needle ice not quite frazil ice. This cluster did grow in a small gully, perhaps with a fair amount of water in the soil at the time of freezing. 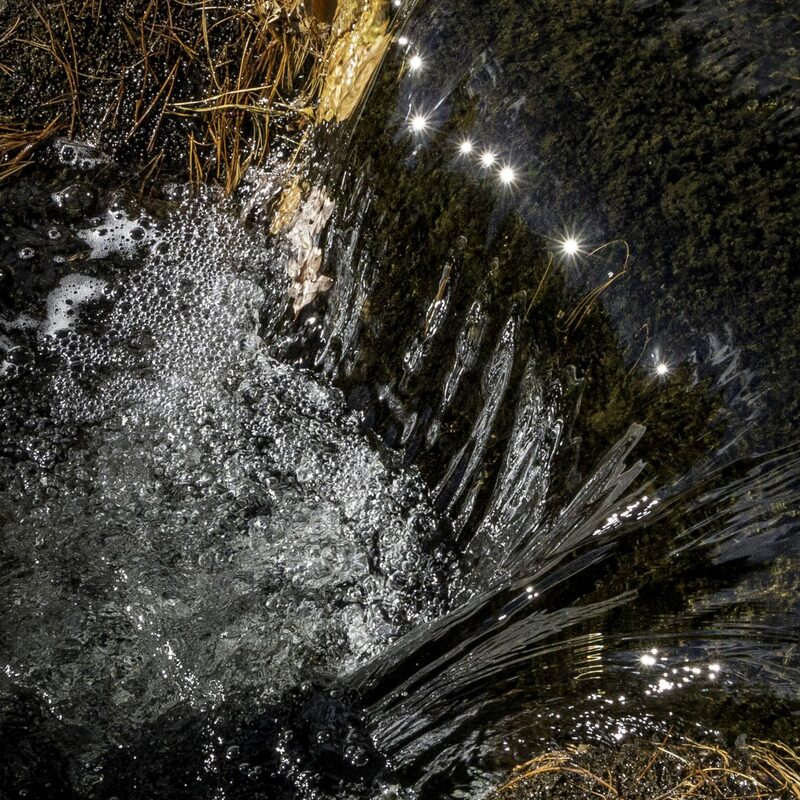 Several of these crystal streams have deep axial rifts. It could be that the thalwegs of these little streamlets were too saturated to allow crystal growth. It did not appear that the rift floors had been modified by crystal growth. This is the setting of the ice palaces. Not very impressive at this scale, is it? 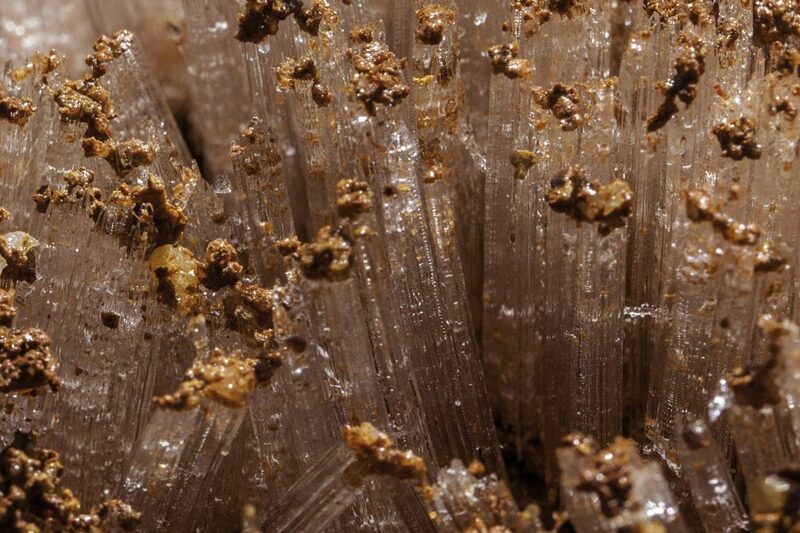 That’s because the most beautiful complexity in geology in the field is sometimes only visible in the Underworld – that diminutive realm within our vision but not often visited. Carter, J. R., 2013, Flowers and ribbons of ice: American Scientist, v. 101, p. 360-369.